Who’ll kill the electric cab? Now that we’re down to T minus 70 days and counting until the Taxi of Tomorrow hits the streets of the Big Apple, there’s been a lot more talk about it’s rollout, both in the news and by my passengers. As I wrote in an earlier post, many people incorrectly think that the Ford Transit Connect is the Taxi of Tomorrow but even though some of those have been on the streets for nearly two years now, none will be active as a yellow cab at the end of the decade should the full implementation of the Nissan NV-200 take place. It did lose out to it in the competition to be the exclusive yellow cab for the City of New York, but since the Crown Victoria is no longer being made by Ford, other models have taken the place of those that have reached the end of their life cycle, and the Transit Connect happens to be one of the more popular choices to replace the cars that have hit retirement age. What will they run on? One of the questions I get the most by my passengers is how the cost of fuel is borne at the end of the shift. Many incorrectly think that the garage pays for whatever we use while we’re on-duty, but if you’ve kept up with my musings on here, you know better than that. Just like a rental car, the Taxis we drive have to be returned in the condition we took them out in – clean, ding-free, and full. Thankfully, my garage has a home station nearby that also serves as a de facto AAA emergency roadside service. The tow trucks that will take us back in case we break down are not based near my garage but in case of a flat tire, a dead battery, or other small problems that arise from time to time, one of the guys who works at the station will take the old taxi that’s been converted to a Saint Bernard on wheels and help us out. It’s a lifesaver since getting towed is time-consuming and as anyone is well aware of, time is money. To take that a step further, time lost during a shift is money lost. The day drivers have it rough when it comes to getting gas since getting in and out of the Station at rush hour is one knock-’em, sock-’em game of musical chairs with everyone else who is trying to get in and out at the same time. At 4:50 in the morning, the streets are empty and the only thing I can count on is that I’ll see the same 5 or 10 guys out of my garage who are finishing their shift at the same time. We almost always agree on how good or bad it was out on the streets that night and we’ll trade barbs on what we went through during the previous 12 hours. In a field where it’s pretty much every driver for him or herself, it’s the only time where I feel like I can bond with those that put in the same hours and working conditions that I do. Could all of this change in the near future? 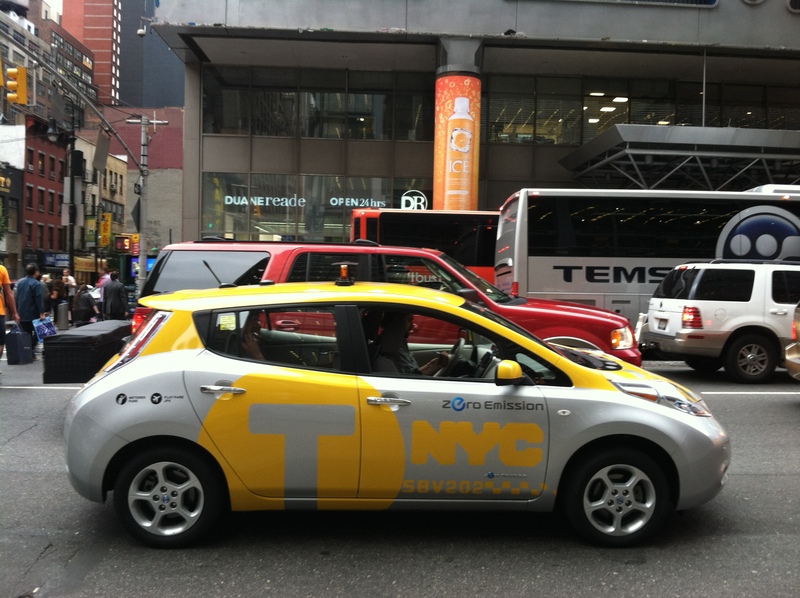 A few months back, Nissan helped launch 6 electric LEAF Taxis to join the 13,000+ gasoline and hybrid vehicles that currently make up the fleet in New York. All of them look like the one pictured above and have the same fare structure as the other Taxis. The real reason for their usage however, is to see whether they can pass muster and handle the day-to-day grind that will take its toll on them. Eventually, the city wants 1/3 of the fleet to be electric by the end of the decade. Of course, that will have to coincide with the NV-200 being the exclusive model of Taxi by that time, even though none of the ones set to hit the street this year are slated to run via a charger and battery. This brings up a host of problems that will have to be addressed. 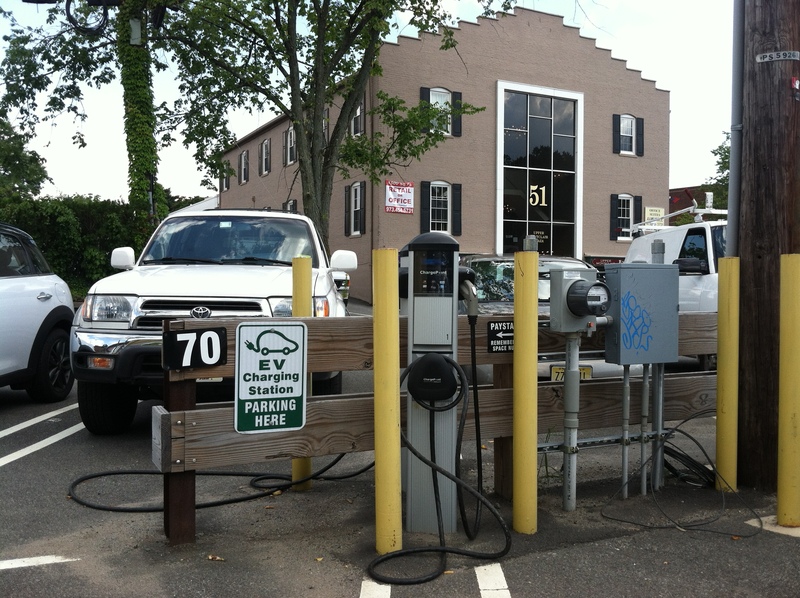 For starters, there are only a limited number of charging stations currently in the 5 Boroughs. Garages are expected to have the stations first before they become more widely available but for now, an app is needed to locate them. Then there’s the time factor. Most of the Taxis in the overall fleet are on the road at least 20 hours a day, nearly every day of the week. Steady cars get traded off between partners and the others are dispatched out to the daily or nightly drivers. It’s not uncommon for a Taxi to rack up well over 300,000 miles during its 6-year lifespan on the streets before it hits retirement age and is decommissioned. Charging, for all the advances made in it in the last few years, still takes a while and has to be done on vehicles that are not on the road for two shifts a day. Once the time to fully recharge a battery drops, this can change and then can an electric cab can be on-duty for nearly the entire day (or night). Last but not least, there’s the issue of the battery. Ask anyone who’s had to pay for a new one in a hybrid vehicle and you’ll probably get sighs and groans as a response. They’re not cheap and their replacement can easily wipe out the savings in gas in a heartbeat. The cars currently on the road haven’t had to go through that yet but eventually, they will and the cost will have to be borne by someone in order to keep them running. Their range between charges isn’t terribly far either and for someone like me who drives nearly the entire time in a 12-hour shift, 140-150 miles will be the minimum needed to ensure a safe and stress-free night at work. No one ever seems to mention that for all the gas that an electric Taxi will save, it will still need an energy source. A plug may not give off carbon dioxide but the source of the power that feeds into it probably will. Given that Indian Point’s days are numbered and that a majority of the power that New York consumes today is from fossil fuels, how much greenhouse gases are electric vehicles really keeping out of the atmosphere? To me, it’s a shell game that everyone is in favor of without thinking everything through from start to finish. Ultimately, the big issue that this will come down to is going to be the same one that affects so much of what New York’s future depends on, which is infrastructure. Charging stations will have to be widespread, do the job quickly, and be built to last. If 1/3 of the 13,000+ yellow cabs (which could number nearly 15,000 by decade’s end) are to be electric, they will have to withstand the wear and tear that the job will place on them, as well as repeated charges on a near-daily basis. There’s nothing wrong with pushing the edge of what’s technologically possible as a means of efficiency and to help provide better environment for all but when it comes down to nuts and bolts, what matters is whether the person on the street hailing a cab will get into an electric one over a model that’s more familiar and reliable. Usage will dictate what ultimately fails and succeeds. The Second Avenue Subway will cost billions to construct but after years of delays, it will be worth it when tens of thousands of passengers patronize the line once it’s finally open for revenue service. Water Tunnel #3 will be in near-constant use when it comes online in the next few years and any of the new parks along the East and Hudson Rivers will be worth the cost once the attendance numbers and rise in surrounding real estate values are taken into consideration. If the new cabs are up and running at decades end and the average passenger can’t discern between those that run via the pump versus those that run via the charge, than the plan will be a success and New York will be looked at as a leader in alternative energy for the vehicles that service the riding public. Until then, we can only hope that the vast amount of time and money spent on this new technology will not be seen as a wasted opportunity, unlike the ill-fated Chevy Volt. The taxpayers and Taxi riders of Gotham do not deserve a boondoggle, repeated on such a massive scale. This entry was posted in Taxi and tagged Taxi, Taxi of Tomorrow.